2017 and 2018 has seen Glenn touring with Reginald D Hunter for his Some People v. Reginald D. Hunter tour. You also might have heard him on Freestyle with Frankie Boyle, or seen him on Doug Stanhope’s The Comedians' Comedian's Comedians (SeeSo), which was recorded at SXSW..
Glenn began his comedy career in his hometown of Vancouver in 1995. He moved to London in 1998 and quickly became an established star of the London comedy circuit before becoming a globally recognised name. His TV credits include John Oliver’s 'New York Stand-Up Show' as well as appearances on The Green Room with Paul Provenza, 8 Out of 10 Cats, Never Mind the Buzzcocks, Russell Howard’s Good News and numerous other UK stand-up shows. In 2016 Glenn was featured on The John Bishop Show on BBC1 and hosted a new NBC series Before the Morning After. He also lent his voice (along with Katherine Ryan) to the BAFTA award-winning Lottie Bearshout: Good as Goaled for Disney XD. 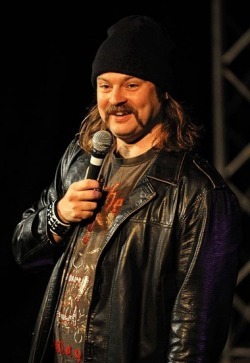 In recent years Glenn has dominated the international comedy circuit, performing to huge crowds in Holland, Singapore, Dubai, Cape Town, Melbourne, Montreal, LA, New York, Auckland and Sydney. He is a hugely popular addition to many of the great summer music festivals in the UK, including Reading & Leeds, Bestival, Download, Sonisphere and Glastonbury.